Via the telegraph, the alarm is sounded! Panel 1: “I must again call up the regiment!” Theodore Roosevelt exclaims. We see TR in the same attic room surrounded by books. There are big attic windows draped with yellow curtains, and, in front of Roosevelt there’s a desk covered in letters, papers, books, an ashtray, a rolodex, a vase of flowers, and, also, the same telephone seen on the previous page. Historical inaccuracy note: I’m depicting a telephone in the Roosevelt home at Sagamore Hill, but, in reality, there wasn’t a phone installed there at this time (1898) and there remained no phone at Sagamore Hill until the eve of WWI, roughly 18 years after my comic is set. 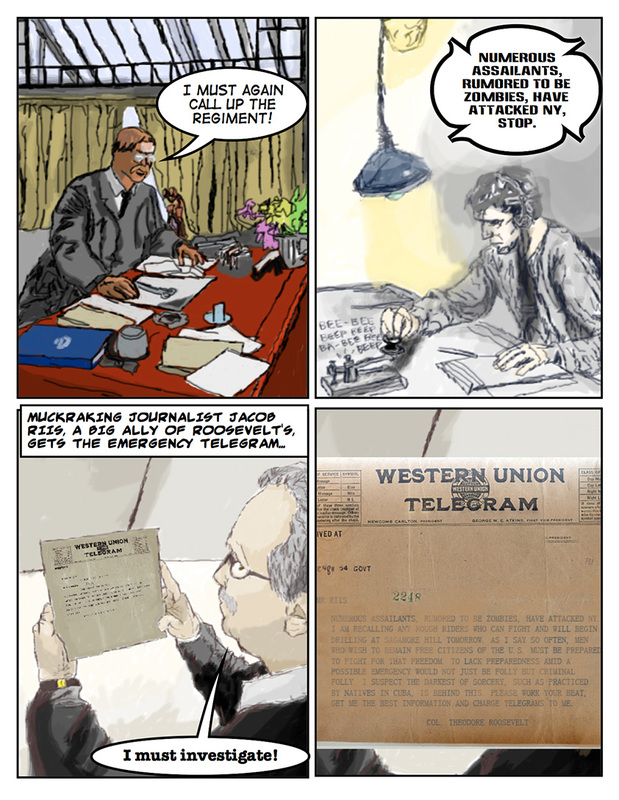 Panel 2: A telegraph operator, headset on and behind a desk, taps out a telegram TR’s sending out. A jagged transmission caption shows the message “NUMEROUS ASSAILANTS, RUMORED TO BE ZOMBIES, HAVE ATTACKED NY, STOP” going over the wires. Panel 3: A narration box atop the panel explains: “Muckraking journalist Jacob Riis, a big ally of Roosevelt’s, gets the emergency telegram” and the panel itself shows Jacob Riis from the torso up, seated, holding the Roosevelt telegram up to see it. Numerous assailants, rumored to be zombies, have attacked NY. I am recalling any Rough Riders who can fight and will begin drilling at Sagamore Hill tomorrow. As I say so often, men who wish to remain free citizens of the U.S. must be prepared to fight for that freedom. To lack preparedness amid a possible emergency would not just be folly but criminal folly. I suspect the darkest of sorcery, such as practiced by natives in Cuba, is behind this. Please work your beat, get me the best information, and charge telegrams to me. Learning a ton from these neat arceltis. Merci pour les rÃ©fÃ©rences !Je viens de regarder les presque 45 minutes d’une partie de Skull&Roses tournÃ©es sur Trictrac.tv. Excellent ! Ce jeu a l’air d’Ãªtre simple et de bon goÃ»t, bien loin de l’image que (Ã©tant trÃ¨s Ã©loignÃ© des jeux de sociÃ©tÃ©) je m’Ã©tais fait des jeux !